Cooper Point neighborhood encompasses a large area primarily north of Highway 101 between Eld Inlet and Budd Inlet. It is also the home of the Evergreen State College, Grass Lake Refuge, Yauger Park and the Olympia Country and Golf Club. Homes for sale in the Cooper Point area range from well-established ramblers in neighborhoods to luxury estates on or with views of the waterfront. 5 Beds | 3.75 Baths | 5936 sq. 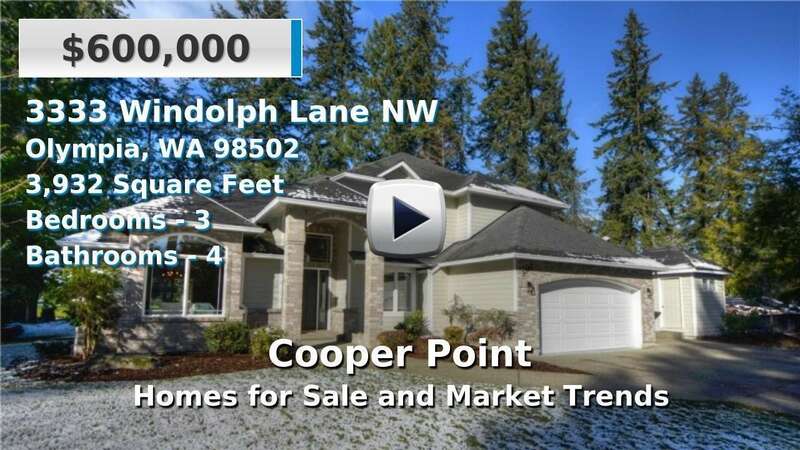 Ft.
Blue Summit Realty has the most accurate and up to date Cooper Point real estate listings on the web. Currently there are 3 homes for sale, 1 condos for sale, and 6 vacant land properties in Cooper Point. Of the 10 total Cooper Point residential listings for sale 0 are bank owned, 0 are short sales, 0 are new construction, and 0 are townhomes. The price ranges from $325,000 to $0 with a median list price of $861,000 and median sold price of $420,358. Make sure to refine your Cooper Point real estate search by property type, price, square footage, bedrooms, bathrooms and more with the search tool above or view the Cooper Point listings on our interactive map. Our Cooper Point real estate listings were updated 4 minutes ago.